11 venture backed companies raised funds at a valuation of over $1 billion in Q114, more than did so in all of 2013. Investment in later stage comprised 47% of all dollars invested in Q1, while Series A investment fell to a five quarter low at 15%. The late stage venture market has been booming spectacularly in Silicon Valley. This source of capital enabling companies to remain private longer and become larger before an IPO or sale. After reading the report, I became curious about the trends in the US broadly, so I ran three quick analyses on Crunchbase data. 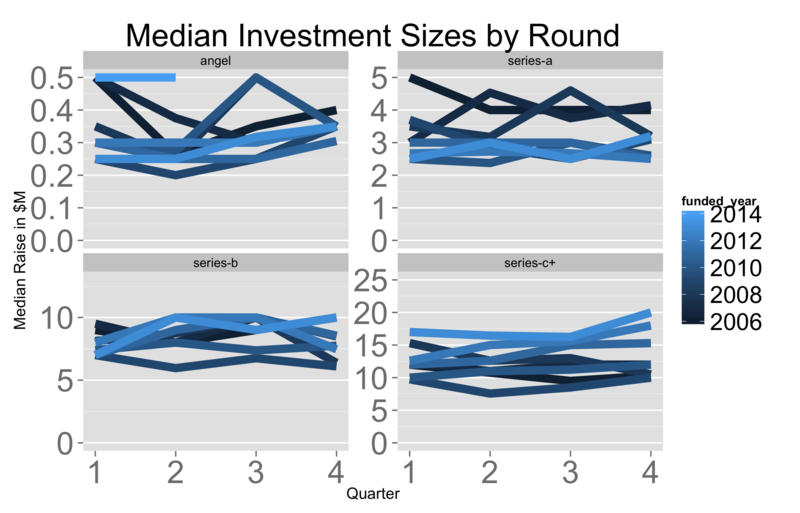 First, the median investment sizes by round are relatively constant for the earlier rounds (angel, series-a, series-b). But Series C+ have seen a steady growth over the past 8 years. This indicates the growth in the size of later rounds has been broadly felt. Second, as a share of the total venture dollars raised, growth rounds have been growing nearly monotonically, pushing the Series A and Series B share below 20% each. This implies that the lion’s share of venture dollars and in particular, the newer larger funds are invested in growth rounds. If the fundraising trends in Q1 continue for the year, VCs will raise twice as much capital in 2014 as 2013 ($36B vs $17B). The majority of those dollars will pursue late stage, pre-IPO opportunities rather than bolster the early stage market, provided the private market remain relatively insulated from the correcting consumer and enterprise companies in the public market. Third, geographic concentration seems to be increasing. San Francisco has seen a meteoric rise of share of venture dollars invested, growing from less than 10% to more than 20% last year. Curiously, Palo Alto’s share has skyrocketed, driven by one investment in particular: the Cloudera $750M round. So, the recent decline in SF’s share of dollars seems to be an aberration. New York has also been growing steadily. The venture market is changing rapidly. Mega-rounds are now part of the modern venture landscape. Geographic concentrations are shifting. Startups are becoming larger and larger. I suspect there will be a retrenchment in later stage investments both in the Bay Area and across the US more broadly. It’s still unclear to me how this growth investment market correction will impact earlier stage investments. Most of the Q1 data predates the February public market correction. 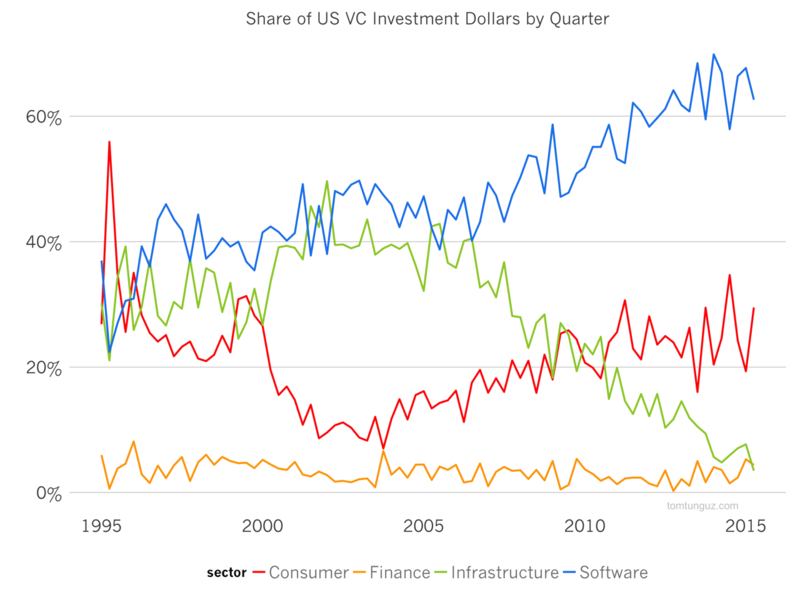 Q2 will be an important bellwether to gauge the bullishness of the venture industry for 2014.